Manchester has had a long association with the sport of American Football in the UK. The first ever game between two British teams took place in October 1983 and featured the Northwich Spartans against the London Ravens. The following year, Northwich became the Manchester Spartans and along with other Mancunian teams the Allstars and Heroes, brought continued success to the city over the next few seasons. The sport suffered decline in the UK during the 1990s and ultimately all 3 Manchester teams were forced to disband and American Football players in Manchester were forced to travel to play. It was to be the best part of a decade before the sport was to return to Manchester. 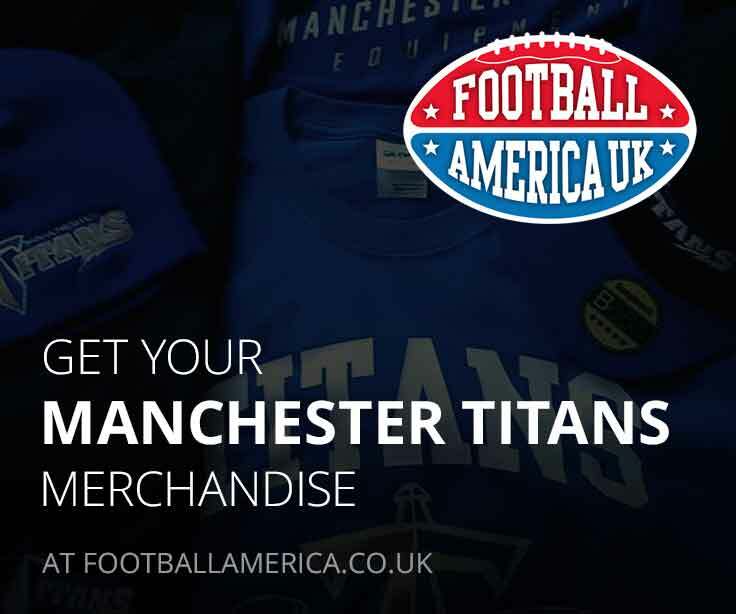 In 2003 this dark period was too end, inspired by the Film, Remember the Titans, the Manchester Titans were formed by local players frustrated at having to travel. They gained affiliation in 2003, playing at Old Bedians Rugby Club in Didsbury, and entered the league with a fledgling team. In this first season the team fought valiantly and achieved a 1-8-1 record. In 2004, the Titans withdrew from the League so that the organisation could be re-structured, new coaches were brought in, new players joined the team and by the start of the 2005 season the team was ready to rejoin the league. A 5-5 record was good enough for 2nd place in Division 2 Central and a place in the play-offs. A defeat at the hands of the West Coast Trojans ended the team’s playoff progress but didn’t dampen the enthusiasm of the players in their first year back in the League. The Titans faced a tougher 2006 season, with high hopes for improving on 2005 that were dashed by several injuries to key players, the team still played well and finished with a 3-6-1 record. Despite the disappointing record the team was growing and for the start of the 2007 they moved to their new home at Broughton Park Rugby Club. The Team also had a change in image, the changed from playing in Red to a new White and Blue kit and started the new season on a high. The 2007 season saw the BAFL re-align the divisions and in a very competitive Northern conference they achieved a 7-2-1 record, the teams best to date and entered the play-offs, a win against Central champions Nottingham Cesears saw the team progress but their play-off journey ended in the semi-finals with a loss against the Dundee Hurricanes. 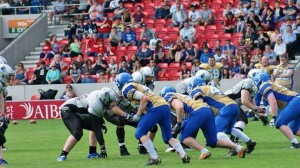 The 2007 season saw the Titans record 2 victories over the Lancashire Wolverines and a win and a tie against the Merseyside Nighthawks, establishing the Titans place as the North-Wests premier team. In 2008 the Titans had high hopes of making another playoff appearance, and they posted another winning season finishing with a 6-4 record. Unfortunately their record was not quite good enough for them to reach the playoffs, as Lancashire finished with an identical record but won the head to head over their two games with the Titans by a single point. 2009 saw a record breaking season for the Titans that ended much earlier than they would have liked. After going 10-0 through the regular season in which they added over 35 points a game while only conceding 5, their season came to an abrupt end when they were defeated 39-15 at home to the Leicester Falcons in the first round of the playoffs. As disappointing as this game may have been, the Titans are sure to learn from this loss as they prepare for the upcoming 2010 season. 2010 saw the Titans continue their regular-season form going undefeated 10-0 for the second year running. Learning from 2009′s shock defeat to Leicester they were better prepared for the postseason; seeing off Scotland’s West Coast Trojans 33-22 and Shropshire Revolution 28-20 in the quarter and semi-finals respectively and securing the Titans first ever trip to a national final and automatic promotion to Division 1. The Titans met another unbeaten side in the final, the London Olympians, it was a tough encounter with London eventually winning 35-13. 2011 was the not the year the Titans hoped it would be. Following the success of 2010 the Titans said farewell to a worrying amount of players for various reasons, including a total of 7 linemen. Playing in a harder division but fielding a weaker team than in 2010 took its toll and the Titans slumped to a winless 0-10 season despite coming close to victory in four match-ups. Unlike other teams in the league the Titans managed to fulfill all their fixtures, but due to a controversial league re-structure at the end of the season they were relegated back to Division 2 for 2012. 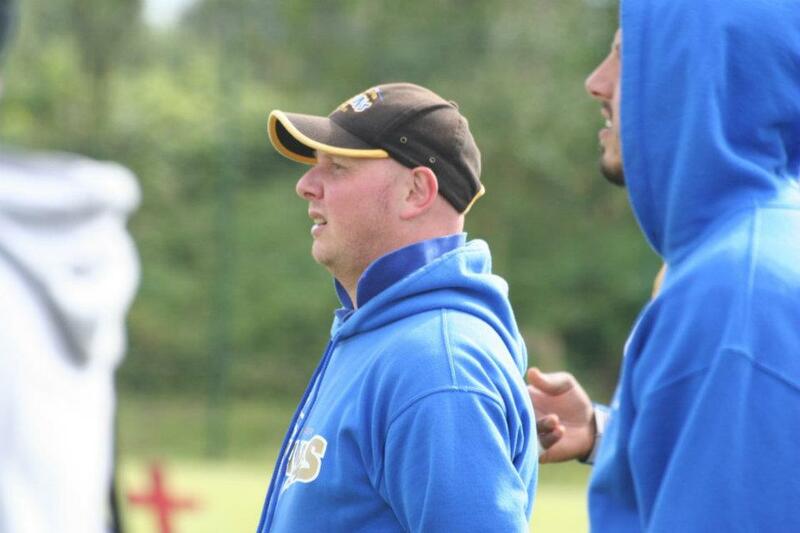 In 2012 long-serving Head Coach Olando Holman retired and Defensive Co-ordinator Phill Chapman appointed was HC. The team produced a respectable 7-2-1 record but missed out on the playoffs because of the tied game against Chester which was unable to be rescheduled due to weather conditions. Off the field, the club went through several changes in the back office and a new committee took over the club after Tony McCulloch stood down as General Manager. The new committee saw the appointment of Britball legend Nigel Dias as Head Coach in 2013 and once again the team went 7-2-1 but missed out on a playoff spot. However the club became much more structured and financially secure. Sky Sports pundit and former NFL player, Cecil Martin held the first of his Football camps at the Titans which was a great success. On the field 2014 was a disappointing year. The team limped to a 5-4-1 record with disappointing losses against Staffordshire, Chester and Merseyside. The Titans did have some bright spots though – they hosted a game for the first time in the AJ Bell Stadium and to a crowd of 1300, produced a fantastic performance in a 69-0 thrashing of the Crewe Railroaders. Gridiron TV recorded the game with Cecil Martin commentating (after hosting another football camp before the game). 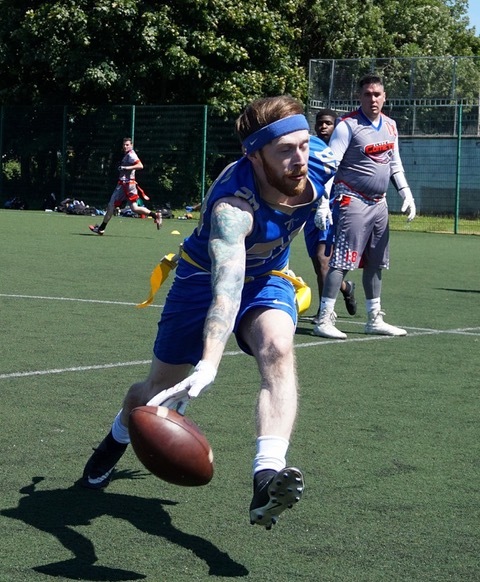 The Titans also battled down from 43-17 down to produce the highest scoring tied game in British American Football history against the Merseyside Nighthawks. Only a blocked extra point in the final seconds preventing an amazing comeback. 2015 saw a renewed determination to move the forwards, with the club now financially secure off the field and new players coming through from the U19 team, the Team rebranded in an all Royal Blue uniform. It was this move that signalled the start of a new era for the Titans, with all teams throughout the club wearing the same kit, the One Club One Future club motto felt real and this was reflected all over. With Offensive Coordinator Thomas Leonard’s offense scoring 555 points and Defensive Coordinator Mark Sloans’ defence conceded just 50 points- including an 18 quarter shutout run mid season, the Titans romped to the BAFANL Div 2 Northern Title and a perfect 10-0 regular season record. The team failed to progress in the play-offs but had done enough to earn promotion into Division 1. 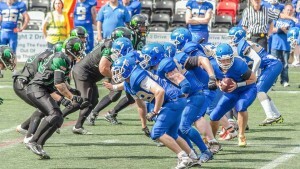 The newly promoted Titans competed strongly in Division 1 during 2016, having stepped up a division they came out of the blocks strong with a victory against former Premier Division team the Yorkshire Rams, finishing with an impressive 7-3 record to finish second behind the promoted Edinburgh Wolves. A play-off trip to Sandwell followed which ended in a tough 35-28 defeat but still capped a great season. 2017 saw a shake-up of coaches. Nigel Dias and Mark Sloan left the Titans after 4 years service with the best wishes of everyone. In their place, former Titans RB and U17 coach Peter Birds became Head Coach and he leads a young coaching staff with former U19 player Luke Carlton returning to the club. Long time Titans Dave Booker took control of the defence with several new coaches joining the Titans from other teams. They enter the 2017 season in the Northern division against Yorkshire Rams, Doncaster Mustangs, West Coast Trojans and Newcastle Vikings with sights firmly set on promotion. The 2017 season saw the Titans promoted to the Premier Division for the first time in their history. A 9-1 regular season clinched the NFC1 North division title and took the Titans into the play-offs as #2 seeds. A repeat of 2016’s quarter final saw the Titans play Sandwell, unlike in 2016 we came out on top winning 29-12 at Belle Vue. The Semi-Final and promotion game was away at Leicester, a team who had defeated the Titans in 2009’s play-offs. 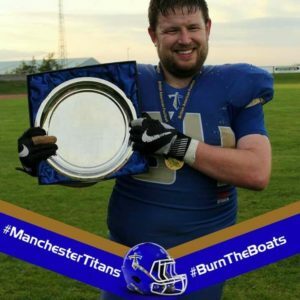 Despite being the underdogs the Titans won a close game 27-21 to clinch a place in the Britbowl but more importantly promotion. The club will provide a Game Jersey and where possible a helmet and shoulder pads. Players must purchase their own gumshield and game pants with padding.